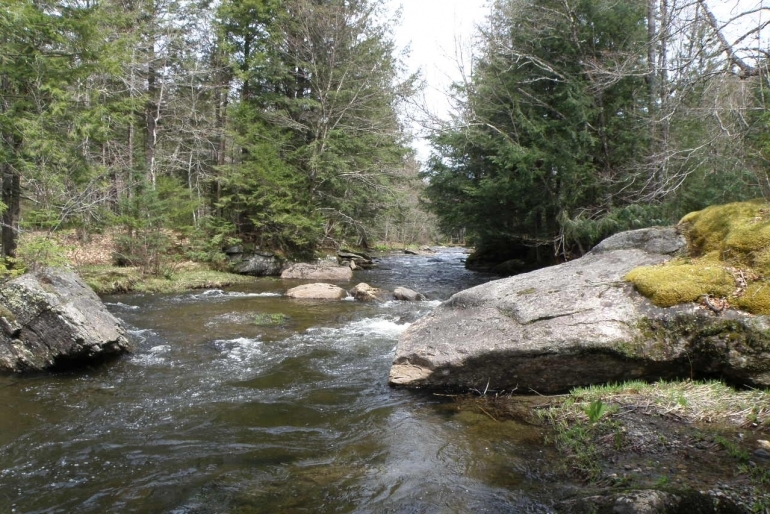 On the northern border of the North Lamoille Forest, where the North Branch of the Lamoille River rushes by, you can imagine that you have your own private river. The property fronts over 4,000 ft of this wild and free-flowing river that tumbles around boulders, courses through tighter passages and, occasionally, slows to a riffled meander. The shoreline is forested with a mix of hardwoods and spruce fir. Behind you, the property slopes up gently to the long road frontage. If you climb a bit, you can get nice views of the Cold Hollow Mountains to the northwest. It’s private, quiet and beautiful. And it has a river. 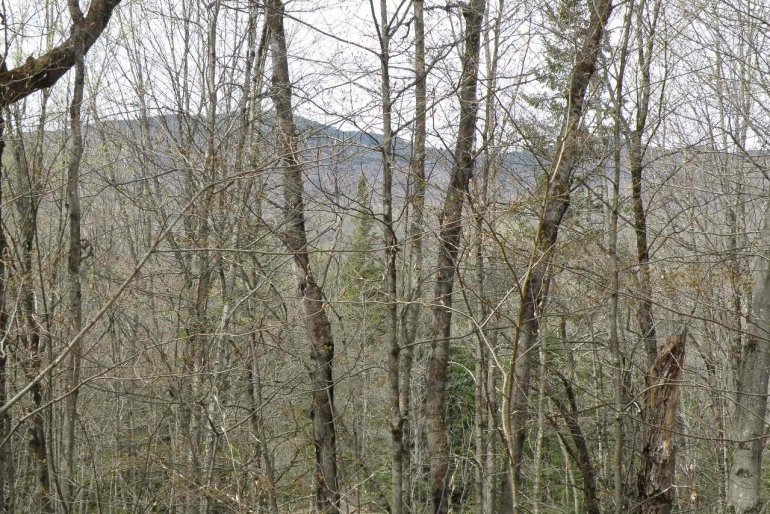 North Lamoille Forest is in a scenic part of northern Vermont with the Green Mountain Range to the east and the Cold Hollow Mountains to the west. Numerous streams and tributaries flow general southward through the area, carving valleys along the way, to join the Lamoille River along Route 15 as it makes its way west to Lake Champlain. Belvidere is little more than a small hamlet on a rural state highway. Johnson, Vermont, the largest nearby town, is 17 miles to the south and is home to Johnson State College. Burlington, Vermont’s largest city, is 56 miles to the southwest, while Montreal, Canada, is 81 miles to the northwest. 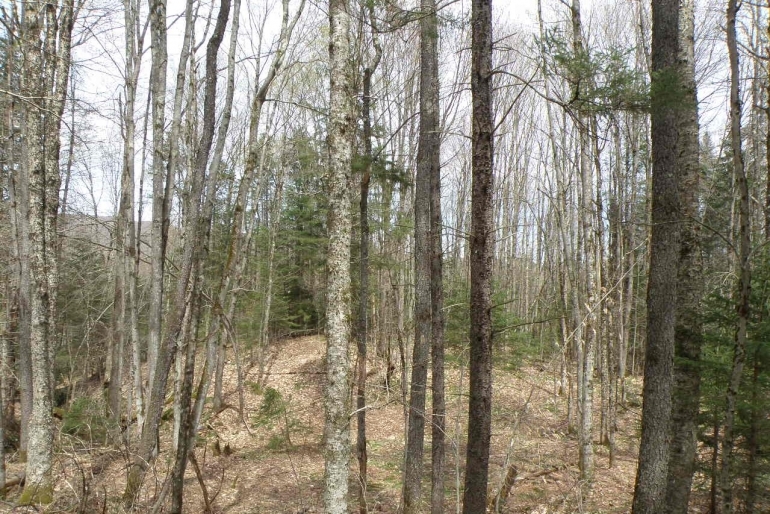 North Lamoille Forest benefits from 2,850 ft of frontage on Bog Road. 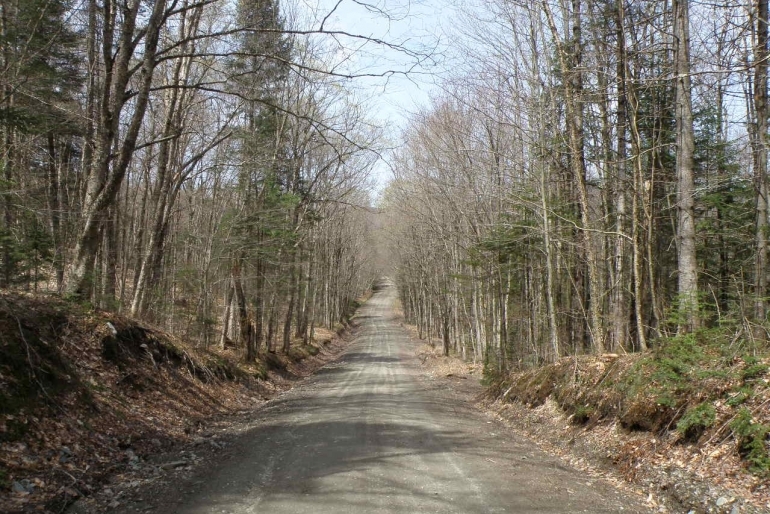 Bog Road is a dirt, town-maintained road that runs 4.25 miles from the intersection of Routes 109 and 118 in the eastern part of town to Route 109 in Belvidere Center to the west. The road is populated by year-round homes on either end, where there is power. In the center section of the road, where there is no power and where the property is located, scattered, seasonal camps are tucked off the road. Power is 1 mile in either direction from the property boundaries. 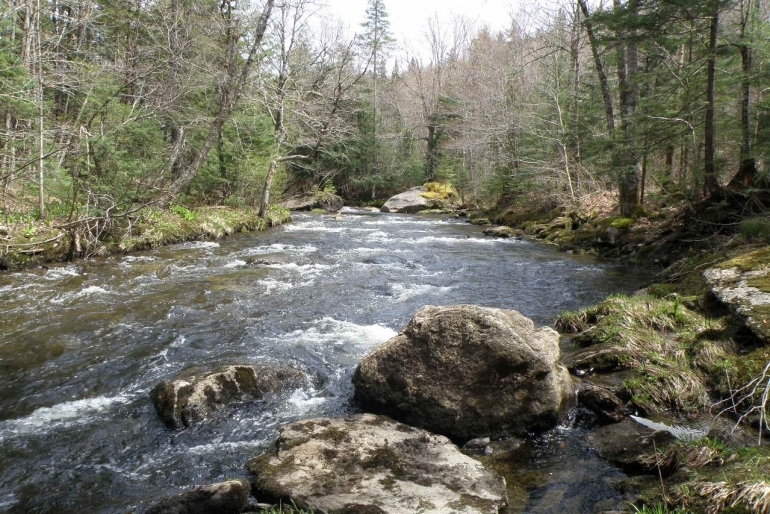 The highlight of the North Lamoille Forest is 4,100 ft of frontage on the North Branch of the Lamoille River. This frontage forms the northern boundary of the property. Along the property, the river flows quickly in most places with pools and eddies forming around rocks in the stream bed. Not only is it a highly scenic river, it is also a great fly fishing spot for trout. Overall, the property slopes down from the road frontage to the river. The slope is mostly gentle with a few steeper sections. A weekend cabin could be constructed on the property’s western side. 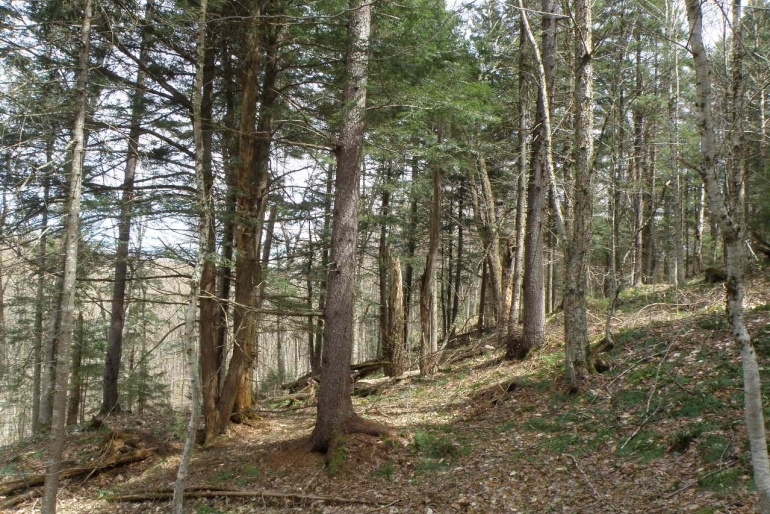 The property is primarily forested with several open, wet meadows. 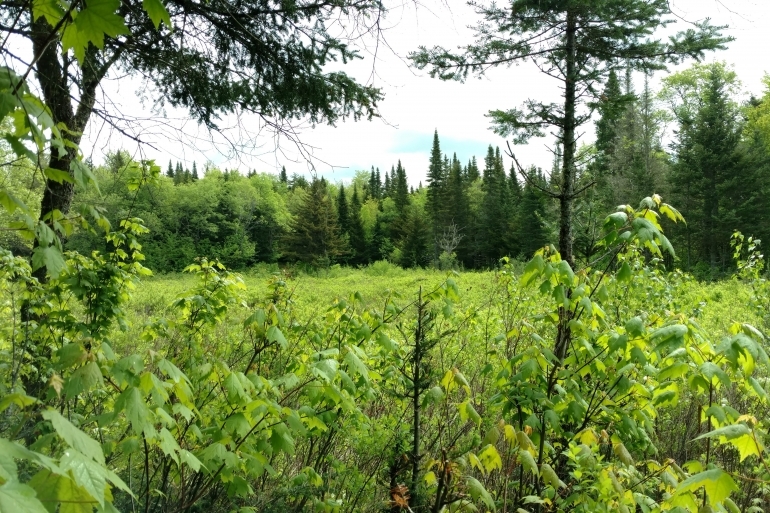 These areas will attract deer, moose, certain songbirds and other wildlife. Standing on the large level area in the center of the property, the Cold Hollow Mountains to the northwest are just visible. With clearing, a beautiful view shed could be exposed. The North Lamoille Forest benefits from 4,100 ft of frontage on the North Branch of the Lamoille River. This frontage forms the northern boundary of the property. The river begins just to the east in three tributaries that form in the hills to the north and east of Route 118 and in Mud Pond that lies along Route 118. The branch river then flows west through Belvidere, turning to the south in the western part of town until it joins the Lamoille River in Waterville. 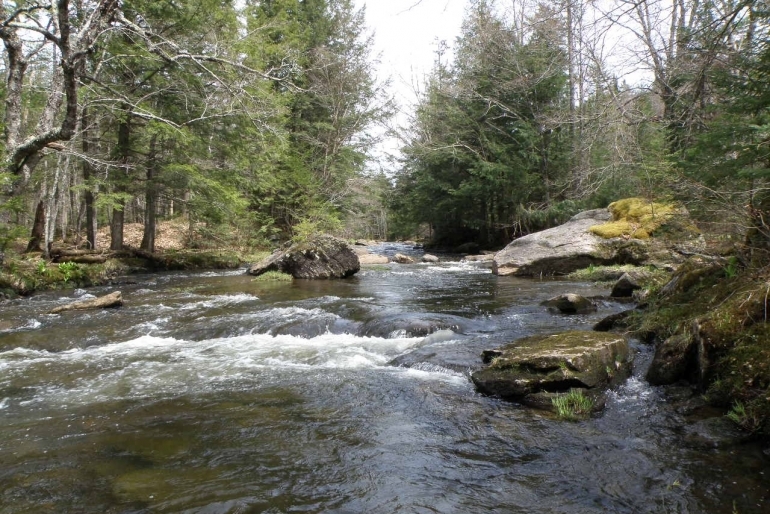 The water runs cold year-round, making it a great trout river.